LEESBURG, Va. — House Democrats ended a three-day policy retreat Friday promising a robust summer agenda, yet grueling legislative fights lie ahead that are sure to bring the party‘s ideological divide to the forefront once again. Speaker Nancy Pelosi (D-Calif.) and her top lieutenants used their time in the Virginia countryside this week to escape the glare of Washington and rally their rank and file while inching the caucus toward high-stakes legislative fights, like infrastructure and drug pricing. They also wanted to move beyond recent internal squabbles on issues like a $ 15 hourly minimum wage bill and Congress’ spending limits, which have exposed splits between the caucus’ left and centrist flanks. 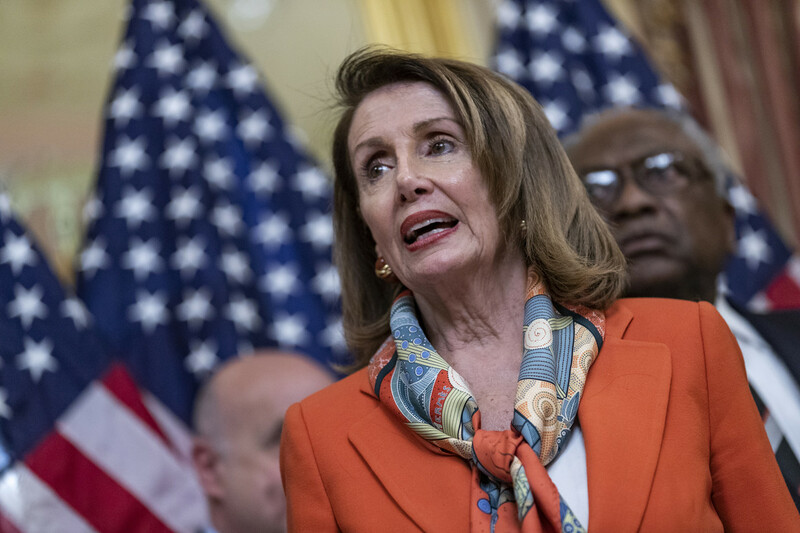 “This was, ‘Hallelujah.’ It was cause for celebration,” Pelosi told reporters Friday, flanked by a half-dozen Democrats at the close of the retreat, which now kicks off a two-week recess. Democrats’ massive undertakings on infrastructure and drug pricing, as well as looming battles over federal spending, the debt ceiling and, potentially, immigration, will test the sprawling caucus’ resolve to stay unified. And for the first time since this year’s staggering 35-day shutdown, it will force Democrats to deal directly with President Donald Trump. Over three days at a country club-style resort, Democrats spoke glowingly about their early legislative achievements, including historic efforts to crack down on Washington corruption, expand gun background checks and close the gender pay gap. Still, they complained their bills have gone nowhere, venting openly about Senate Majority Leader Mitch McConnell’s resistance to bring their proposals to the Senate floor for a vote. And even as House Democrats deepen their probes into the White House, attempt to seize Trump’s tax returns and threaten legal action to obtain special counsel Robert Mueller’s report, they swear they’re willing to try compromise with the president. “We believe there is a window of opportunity to get big things done working in a bipartisan way,” House Democratic Caucus Chairman Hakeem Jeffries added. Minutes later, the New York Democrat went on to sharply rebuke Trump’s picks for the Federal Reserve, his immigration policies and his “reckless” shutdown earlier this year. Away from the Capitol and largely cordoned off from reporters, roughly 170 Democratic lawmakers and their families took part in yoga and a celebrity-chef demo, with several members sharing a tee time at the golf course on-site. Democrats were even able to cut loose with a game of trivia Thursday night, answering questions about Beyoncé’s fan base — one of many Rep. Alexandria Ocasio-Cortez (D-N.Y.) easily got right — and a category titled the “Green New Deal” that was all about marijuana. “The bonding is always good. The question is how long will it last? That’s the big thing,” Clyburn said with a laugh on Friday. Pelosi revealed Thursday that she and Senate Minority Leader Chuck Schumer (D-N.Y.) have made plans to go to the White House to talk infrastructure. Days before that, Pelosi began talks with McConnell about the slew of budget battles looming this fall, which will put government funding as well as the nation’s credit rating on the line. Within about six months, congressional leaders will need to raise the debt ceiling, avert hundreds of billions of dollars in automatic sequester cuts and reach a massive funding deal to avoid another shutdown. Then there’s immigration, with Democrats and Republicans increasingly in agreement that the surge of migrants attempting to seek refuge in the U.S. has become a full-blown crisis — but with wildly divergent views on how to respond. That long list of political battles will require old-fashioned deal-making that will strain Democratic leaders as they attempt to appease their fiery new brand of progressives — as well as the dozens of freshman moderates whose districts are sympathetic to Trump. This point wasn’t lost on Republicans. “Congratulations Madam Speaker, you’ve got a Freedom Caucus,” McConnell said on Thursday. Democratic leaders are already highly sensitive to the notion of party divisions, spending hours here telling reporters that they’ve gotten the wrong idea from smaller-bore policy disputes. “There’s a front page headline I want to deal with, ‘Democrats are not united,’” House Majority Leader Steny Hoyer (D-Md.) told reporters Friday, downplaying the party’s recent failure to pass a budget bill because the caucus’ left and centrist flanks can’t even decide how to split the pot between the Pentagon and domestic programs. Hoyer laid out the agenda for the next two months, with plans for additional messaging bills like reasserting U.S. commitment to the Paris climate accord and condemning the GOP’s attempts to sabotage Obamacare. But Hoyer’s tentative schedule left out a top progressive priority: the $ 15 minimum wage bill that’s ground to a halt as pro-business Democrats have called for a more flexible approach. Top Democrats have repeatedly endorsed the legislation, though they’ve largely left it to the bill’s author, Education and Labor Committee Chairman Bobby Scott (D-Va.), to secure enough votes to bring it to the floor. Scott hosted an early morning session here on Thursday to tout his bill. But he found himself preaching to the choir — with just a handful of lawmakers showing up. Later that day, a trio of labor leaders made the pitch for Scott’s bill during a larger session with lawmakers. “The conversations between members throughout the retreat definitely moved the ball forward. It’s clear that leadership stands behind the bill and is committed to getting it across the line,” said a Democratic aide. But several Democrats said the issues that have stymied Scott’s bill so far — namely pushback from moderate lawmakers who want to see a more tiered approach to raising the minimum wage — are still very much present. Rep. Terri Sewell (D-Ala.), who has introduced her own version that allows lower hourly wages in rural areas, defended her bill to reporters later during the retreat. Many rank-and-file Democrats, particularly freshmen, stressed to reporters during the retreat that they are eager to work with the White House, echoing their stump speeches from last fall’s campaigns. There was, notably, no talk throughout the retreat of the Democratic Caucus’ mounting investigations, even as rumors swirled that the Department of Justice could release a redacted version of the Mueller report within days. “Whatever we can do that does not make me depart from my values, and the reasons why I came to Congress, I’ll work with everybody,” Hayes said.